By Kori ~ July 21st, 2011. Would you like a quick suggestion for a good wine to drink tonight (or this weekend) that wonâ€™t break your budget and is widely available? Many of our readers have said this is something they would like, so here is this weekâ€™s selection, the 2009 Penfolds Koonunga Hill Shiraz Cabernet from South Australia. Penfolds is one of the oldest and most well-respected wineries in Australia. Located in South Australia, Penfolds was established by a transplanted English doctor in 1844. Dr. Christopher Rawson Penfold and his wife Mary built their home at Magill, near Adelaide, and surrounded it with vine cuttings they brought from the south of France. Today, Penfolds boasts two cellar doors (aka tasting rooms), one at the original Magill Estate and the other in Nuriootpa in the heart of the Barossa Valley. Penfolds is most famous for its top of the line Grange wines. This Koonunga Hill wine is from one of their value lines. Nevertheless, according to some â€œexperts,â€ it is a wine that can age for 20 years which is remarkable for a wine at this price point. 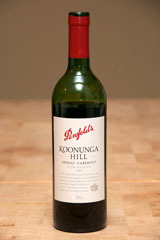 2009 Penfolds Koonunga Hill Shiraz Cabernet (South Australia, Australia): 73% Shiraz, 27% Cabernet Sauvignon. Deep, dark purple. Very aromatic with blackberry jam, black pepper, and spice on both the nose and palate. Medium to full-bodied with lively acidity and medium to high tannins. Well-balanced and smooth with a long finish. Very intriguing choice of wine. Had not considered Australian wine before but trust your recommendations and will definitely consider buying. Adelaide is a lovely place too with the typical beauty that is unique to Australia. I definitely encourage you to try some Australian wines. They offer some great wines at great values. Yes, Adelaide is a wonderful place. We had a wonderful time when we visited the Barossa Valley in 2005. Cheers! I was given a bottle of this on Christmas by my boss as a holiday gift. Ordinarily, I am not a huge fan of most reds, as they are a bit bitter for my tastes. However, after trying a glass, I must say that this is one of few reds that I do like. It has a slight bitterness, and a good taste. Even if the bottle weren’t a gift, I would definitely buy a bottle. Seems like it would go quite well with a nice steak or a pasta with red sauce. Glad to hear it. Hope you enjoy it. Happy New Year!